WORKER - TL 6.5-7.0 mm. Head longer than broad, as broad in front as behind, with feebly and broadly excised posterior border and feebly convex sides. Eyes rather large, feebly convex placed with their posterior orbits just in front of the middle of the sides. Mandibles very long, narrow, with feebly concave external borders, the apical border very long toothless except at the tip where there are four small, blunt, oblique teeth. Clypeus carinate, its anterior border broadly projecting, sinuate on each side of the middle and also more deeply at each mandibular insertion. Frontal carinae short, their upper surfaces rather concave. 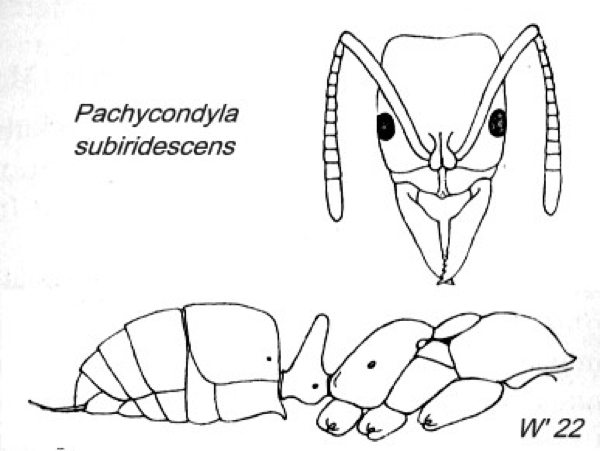 Antennae slender, the scapes extending beyond the posterior border of the head a distance nearly equal to twice their greatest diameter; funicular joints 1 and 2 subequal, almost twice as long as broad; joints 3 to 5 somewhat shorter; remaining joints, except the last, little, if at all longer than broad. Pronotum rather convex and rounded, as long as broad; mesonotum transverse, semicircular, surrounded by an impressed suture. Metanotal groove distinct. Propodeum as long as the pro- and mesonotum together, the base rounded and convex, somewhat lower than the mesonotum, passing gradually into the somewhat longer, sloping declivity, which is flat and bluntly marginate on the sides. Petiolar scale shaped as in ingesta, but not so thick, with the anterior surface more flattened and the posterior not impressed in the middle. Gaster short and stout, convex above, the postpetiole truncated in front, the constriction between it and the succeeding segment very feeble. Legs moderately long. Shining; mandibles more so than the remainder of the body, smooth, with only, a few large punctures along the apical margin. Remainder of body very finely but not deeply punctate and less densely than in ingesta. Hairs lacking, except on the mandibles, clypeus, pygidium, and hypopygium, where they are pale yellow and rather long; the pubescence, too, is yellowish and rather long and abundant on the body and appendages, longest on the gaster. Deep castaneous, almost black; the head and thorax with a more or less distinct blue iridescence as in some species of Leptogenys (as Lobopelta, e.g iridescens and chinensis)), inner borders of mandibles, the legs, antennae, and tip of gaster somewhat paler and more reddish. 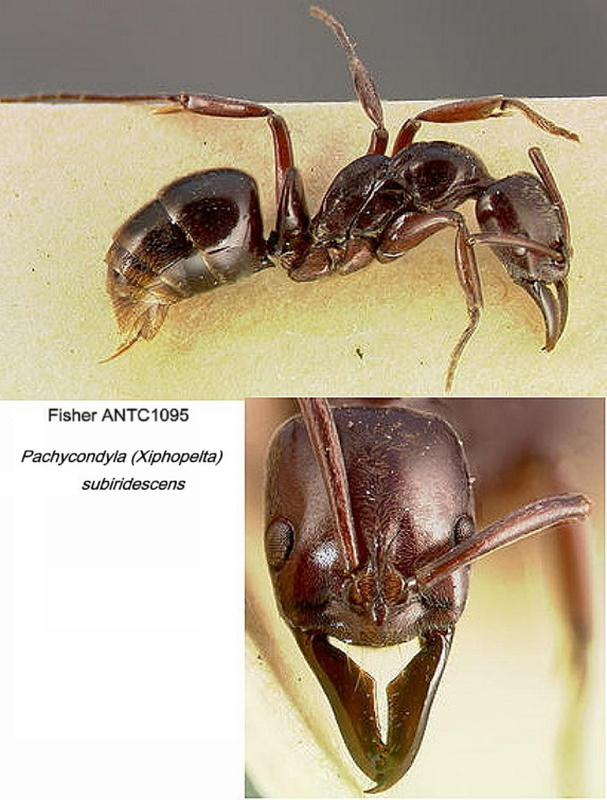 The photomontage is collated from http://www.antweb.org/specimen.do?name=casent0003151.